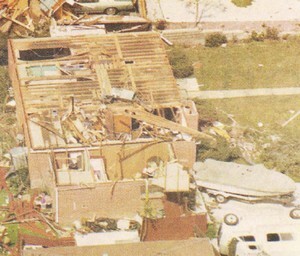 On June 3, 1981 a tornado struck Thornton in what is the worst twister to have struck the Denver metro area. Are you ready should disaster strike again? Image courtesy the City of Thornton archives. Severe weather is a fact of life in Colorado – from blizzards to tornadoes we can and do see it all. Each year the weather is responsible for claiming lives in our state and across the nation and the threat is very real. Storm spotter training allows you to learn how to protect yourself and your family while providing a public service. Education is key to knowing how to protect you and your family. Whether you want to be an official storm spotter or maybe just want to learn more about severe weather, storm spotter training can provide you an incredible opportunity to learn. The National Weather Service Denver / Boulder office has announced a series of Skywarn storm spotter training dates for Colorado for the 2019 season. The storm spotter program is a nationwide program with more than 280,000 trained spotters. These volunteers report weather hazards to their local National Weather Service office providing vital information when severe strikes. Data from spotters include severe wind, rain, snow measurements, thunderstorms and hail and of course tornadoes. Storm spotters are part of the ranks of citizens who form the Nation’s first line of defense against severe weather. There can be no finer reward than to know that their efforts have given communities the precious gift of time–seconds and minutes that can help save lives. By completing one of these training classes you can become an official storm spotter. When severe weather strikes, you can report it by calling a special toll free number or submit your report via the National Weather Service’s website. Below are the dates, times and locations announced thus far. The embedded calendar should automatically update with new dates and changes but be sure to check the National Weather Service site for the latest. This entry was posted on Saturday, April 20th, 2019 at 5:01am MDT and is filed under Thornton Weather, Weather Education. You can follow any responses to this entry through the RSS 2.0 feed. You can skip to the end and leave a response. Pinging is currently not allowed.